Here is the third question from Victor Maisano, 2013 Appalachian Trail thru-hiker. Victor: How many knives do you need to bring on the AT? As an Eagle Scout and He-Man fan, I love playing with knives. I am thinking about bringing a multi-tool (Skeletol), a small serrated pocketknife, and perhaps a large blade (Buck knife) to be strapped to my backpack for defense and possibly splitting wood. Do you think that is overkill? Me: Generally, anything redundant on a long-distance hike will end up being sent back home or chucked in a hiker box. I cut my toothbrush in half to reduce my pack weight, which I admit is ridiculous. With 300 miles to go, I even sent my tent home to save weight. So, I would choose one knife and maybe consider letting the other people in your group carry the others. When it comes to gear advice, it's hard to tell another backpacker what they should carry, because gear choices are relative to each hiker's preference. I mean, my He-Man fandom makes me want to ride a green armored tiger down the trail, so clearly we are all unique. If you like to play with knives, whittle, or want to split wood, your needs will be different than mine. Although, to be fair, everyone wants to charge through the woods on the back of a green tiger. Nevertheless, when choosing gear, it is helpful to learn why hikers do what they do, so I'll stick to that. I've carried a few different types of blades on the trails: a multi-tool, lightweight pocket knives, serrated and non-serrated, and a fixed-blade knife, but lately, and more often than not, I just carry a razor blade in my matchbox. I suspect a lot of people will disagree with me on that, so for the record, I'm not saying there is zero risk in not carrying a proper knife. I agree that no tool is more useful in a survival situation than a knife. You can use it to build shelter, light a fire, and procure food and water, but on a trail like the AT, it's not likely you'll need it for that. You'll probably see at least one hiker every day, and you'll never be more than a few days from a road or town, as long as you stick to the trail. 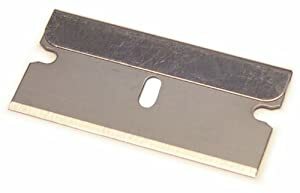 So far, regardless of what I've carried, a razor blade is all I've ever really needed. Usually, when I pull out my knife it's to slice a block of cheese or cut cordage or rope. It doesn't mean a knife hasn't been useful for other things, or offered some peace of mind, it's just that I could have always gotten by with a simple razor blade. That being said, if I'm going into a remote area or if there is a chance I'll be going off-trail, I'll take my 4 oz. Swedish Mora (fixed-blade) knife. This seems to be a very popular knife lately, so I jumped on the bandwagon. It's cheap, lightweight, and has a durable sharp blade that can easily be sharpened in the field. There aren't many wildlife encounters where a knife will be more helpful than learning how to properly handle the situation. For example, click here for the National Park Service guidelines for bear safety. You may have been thinking more about encounters with other humans, though. That is also very rare on the AT, but it happens. It would be a miracle if it never happened, but it is less frequent than if walking down a street. 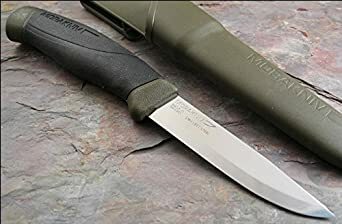 So in conclusion, since it's very likely you will be trying to lighten your pack during the first few days or weeks on the trail, to save you the hassle of shipping your other knives back home, my recommendation is to only carry one. Choose the one that you feel offers the best combination of usefulness and lightness. That will probably be the serrated pocketknife, but if you feel better about having the heavier buck knife, by all means, take it. A few ounces are worth the peace of mind. As with all gear, as long as you're thinking about why you are carrying it, and accept the risks of not carrying it, you'll make the right choice for you. Now if you'll excuse me, I'm going to go search for He-Man cartoons on You Tube.